Open a can of anything in our kitchen, and the kitties are there in a shot. They exist in a state of constant hope for a nibble of their favorite treat, glorious tuna. Buddy and Daisy, this one’s for you, tuna on rye for kitties! There is no creature that can look as comfortable as a cat!!!!!! 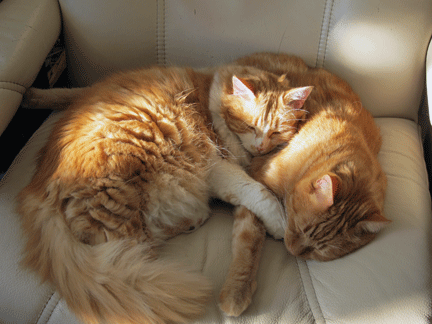 Sometimes we come home and each of them has taken over our favorite chairs…Larry calls us “the staff”. Ha ha! Perfect recipe. Love the photo of the cats — gorgeous. They rule the roost here – thanks! Buddy and Daisy are so gorgeous! Give little Leo a pat for me – perhaps he isn’t so little these days!! Lucky kitties! The recipe has me wondering . . . . Have they seen Jack Nicholson in “Five Easy Pieces”?